“The trial of Mohamed Mursi is not taking place in the same manner as the trial of Mohamed Hosni [Mubarak]. 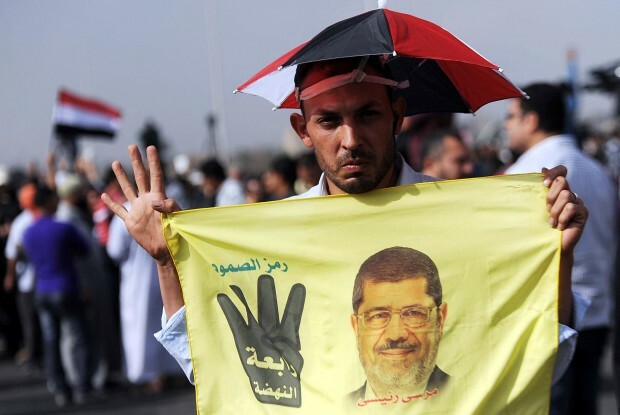 If Mursi has committed crimes against the people, then we, as the people, should have the right . . . to see what is happening inside the court,” one Egyptian citizen opined as he was interviewed on Egypt’s Nile Television Network last month during Mohamed Mursi’s trial. “Otherwise, this means that you are afraid, that you are the criminal, and so what happened was a coup, not a revolution,” he added, to the applause of the small crowd gathered around him. As many Egyptians, including myself, look ahead to Mohamed Mursi’s next court date (his case was adjourned until January 2014), we find ourselves overcome by a curious blend of emotions: bemusement and dread, as well as a desire to simply move on. As for Hosni Mubarak’s newest court appointment—the former president and his two sons have been referred to criminal court once again over new financial corruption charges—it has become nothing more than a sideshow to the main event. Mohamed Mursi, the former Egyptian president, strode into court last month like a prizefighter entering the ring: “I am Dr. Mohamed Mursi, the President of the Republic. I am Egypt’s legitimate president. You have no right to conduct an investigation into presidential matters,” he said, addressing the judiciary. Or, at least, that is what the media and those inside the court reported. The brief footage of the trial provided by Egyptian state TV was curiously silent, with Egyptian authorities evidently afraid of the reaction that the deposed president’s bombastic statements could have on his supporters beyond the courthouse walls. Both liberals and Muslim Brotherhood supporters criticized this move, because a just and fair trial must be transparent. However, the military-backed interim government’s fears may be rational given the media circus that surrounded the trial and the divisive atmosphere that continues to prevail over Egyptian society. This can be seen in both secular liberals and pro-Mursi Islamists coming out this week to protest a controversial protest law—albeit separately. Egyptian media closely scrutinized every aspect of the first session of Mursi’s trial, particularly as this was his first public appearance since his ouster: “What did it mean that he was wearing a suit rather than prison attire?” Psychoanalysts and body language experts appeared on television to painstakingly analyze every second of footage from the courtroom, while legal experts debated Mursi’s refusal to acknowledge the legitimacy of the court, or to officially appoint a legal defense team. As for the Egyptian public, they had been engaged in this pastime for months, eagerly digesting leaks and rumors about former President Mursi’s time in the bowels of the state he once led. “Mursi has his own personal chef and is eating duck every night. Mursi is growing his beard and has become even more religious. Mursi is refusing to wear prison uniform.” The rumors, and jokes, were endless. Egyptians have continued in this vein since the trial and Mursi’s surprise transfer to Alexandria’s Burj Al-Arab prison. The trial and re-trial of Mubarak, on the other hand, is easygoing by comparison. The former president is brought into court on a stretcher, his features obscured by dark glasses, and the big news revolves around whether he waved or smiled. In fact, the more outrageous Mursi acts, the better Mubarak looks. Mubarak stepped down in the face of eighteen days of public protest, while Mursi continues to hang onto claims of legitimacy as the so-called Anti-Coup Alliance discuss escalating protests and even the formation of a government in exile. Ultimately, there is only so much Egyptian public anger to go around, and it is difficult to be angry with two former presidents at the same time. The Egyptian authorities are also facing a dilemma: Egypt’s political transition is under way, and they want to move on, but to do so they must strike a balance between completely burying Mursi and allowing him to have his day in court. The former could serve to make a martyr out of the man and incite his supporters to burn the country to the ground, but the latter could do the same. When former President Mursi next appears in court, Egypt may well have concluded a referendum on a new constitution and be well on the way to parliamentary and presidential elections. Given this, his impending court appearance certainly will not enjoy the same level of media coverage and public obsession; Egyptians want to look forwards, not backwards. The Muslim Brotherhood will continue their protests and disruptions, and the majority of Egyptians will continue to ignore them. Speaking during the final few months of the Mubarak regime, when the prospects of his son, Gamal Mubarak, taking the presidency seemed assured, an Egyptian friend of mine who was searching for a silver lining told me: “Whatever happens, it will be historic. This will be the first time that Egypt has seen a peaceful transfer of power from one living president to the next.” Well, it is three years later and Egypt is still waiting to see a peaceful transition of presidential power. Gamal Abdel Nasser ousted Egypt’s first president Muhammad Naguib. Anwar Sadat succeeded Nasser on his death. Mubarak succeeded Sadat following his assassination, and then the Egyptian people rose up to drive out Mubarak, only to rise up again to get rid of his successor. However, my friend was right in one regard: what happened was historic, for we now have two former presidents, and they are both behind bars. Egypt must be careful to ensure that the next man to join the “Ex-Presidents’ Club” is worthy of the name.